With 24-hour news and social media bombarding us all day and night, I decided not to become consumed by it. I limit my news sources to three: MSNBC Morning Joe with Joe Scarborough and Mika Brzezinski; The Skimm, a daily email newsletter founded by Danielle Weisberg and Carly Zakin; and Twitter, all you need to know about what’s happening in the Triangle in a 140 characters. Both Morning Joe and The Skimm are great for world and national news. As a blogger of Triangle happenings, restaurants and food trucks, I count on Twitter to keep me abreast of Triangle news and events. In the past several months I had noticed tweets about “Beer Dinners.” Now beer, particularly local micro beer, is one of Bad Boy and my favorite beverages; so I needed to check this out. A Beer Dinner is the process of paring food dishes with beer to enhance the dining experience. This modern art of food and beer parings is a relatively recent phenomenon and doesn’t depend on a “set of rules.” It’s all about local cuisines paired with local craft beers. From the tweets it appeared a local brewery and restaurant would partner to present a 5-7 course beer dinner and you would either have to make reservations or buy tickets for it. Well, it’s food and beer (two of our favorite things) and Bad Boy and I just had to do a Beer Dinner. We were in luck, Academy Street Bistro, a restaurant we had on our list to try, and Fortnight Brewery were having a Beer Dinner. This was perfect for us. We arrived via Uber and walked into a cozy, friendly atmosphere. Although small groups had formed, we were warmly accepted into one. As we began munching on appetizers and sipping a porter, we found out this was a first Beer Dinner for everyone in our group. After the reception, we moved into the dinning room for the main event. There were two long tables set up for dining which afforded participants easy conversation and comradely. My favorite plates for the night were the Diver Sea Scallops and Roasted stuffed Pork Loin. Bad Boy agreed with me about the Scallops, but the Pastrami Spiced Venison Medallions was his other favorite. Before dessert was served, Colin explained how the special cask were made and Derek gave us a demonstration on how to infuse beer using a French Press. We ended our beer dinner with a wonderful dessert paired with a Chocolate-Cherry Stout-Special Cask. After the dinner we had the opportunity to meet Chef Brian and his sister-in-law MaryLynn. 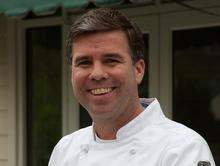 They shared the story behind Academy Street Bistro, how MaryLynn convinced Chef Brian to re-locate and open a farm to table restaurant in downtown Cary. Thanks to both Chef Brian and MaryLynn for making great food available to the residents of Cary. Bad Boy and I will definitely be returning, maybe for Sunday Brunch. Our first Beer Dinner was a great experience and when things calm down after the Holidays we will be checking Twitter for other Beer Dinners to attend. We highly recommend you make reservations for a beer dinner to enjoy all of the culinary delights and local beer the Triangle has to offer.